Once again, tree trunks like Ryan Anderson and Nenê barely saw the floor for the Rockets, but unlike Game 1, the generally smaller, more agile secondary players who were called upon actually came up huge. P.J. Tucker scored 22 points—22 times what he did his last time out—and only missed one field goal. Trevor Ariza shot 7-of-9 from the field after a 3-for-8 Game 1. Eric Gordon picked up 27 points off the bench in his best game of the playoffs so far. James Harden, who shouldered most of the offense Monday night, shot just an iffy 9-for-24, and the Rockets still cruised. For the Warriors’ part, however, nobody except a very aggressive Kevin Durant really showed up. Steph Curry, who looked less than 100 percent healthy, was only 1-for-8 from three, while Klay Thompson could only hit three shots from the field after torching the nets in Game 1. They were sloppy, too, turning the ball over seven times in the first quarter alone, and their 9-of-30 night from deep meant they couldn’t hit enough shots to regain any kind of lead for the final 40 minutes of play. This is by no means a sign that the Rockets will go on to win the series. 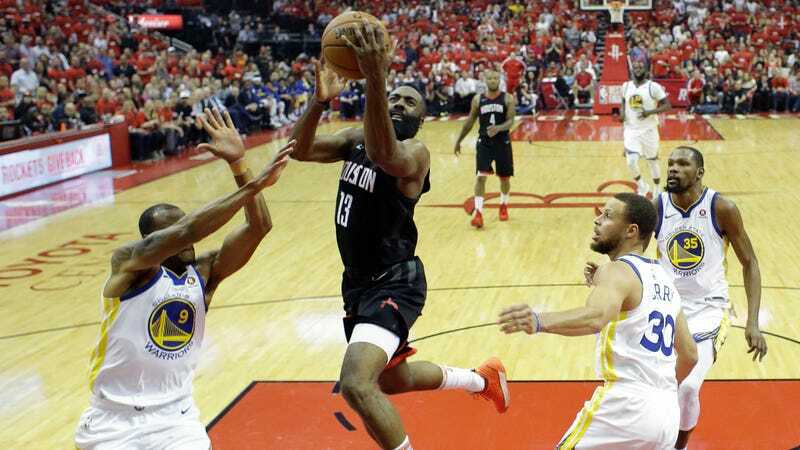 As well as Houston played, the Warriors seemed affected by the team boredom that occasionally showed up in the regular season, and that will likely go away as they return to the Bay Area. However, even if it meant throwing out the regular season playbook, the Rockets have found an offensive style that can actually get them effective possessions against Golden State, which at least puts them back into contention. Even better, this new style is actually appealing to basketball fans.